My home care package has been approved. What do I do next? Did you know? There are several steps to work through from when you receive your initial letter stating you have been approved for a home care package to starting to receive your home care from your chosen home care provider. This may take some time. The team at St Louis Home Care are available to guide you through this application process or to complete it on your behalf, so that you can start using your home care package as soon as possible. To help you understand the process better, we have outlined below what happens after you have completed your ACAT (Aged Care Assessment Team) Assessment and are waiting for your home care package assignment. Please note, that when you receive your home care package approval, you have not yet been assigned a home care package, this comes later and we discuss this below. 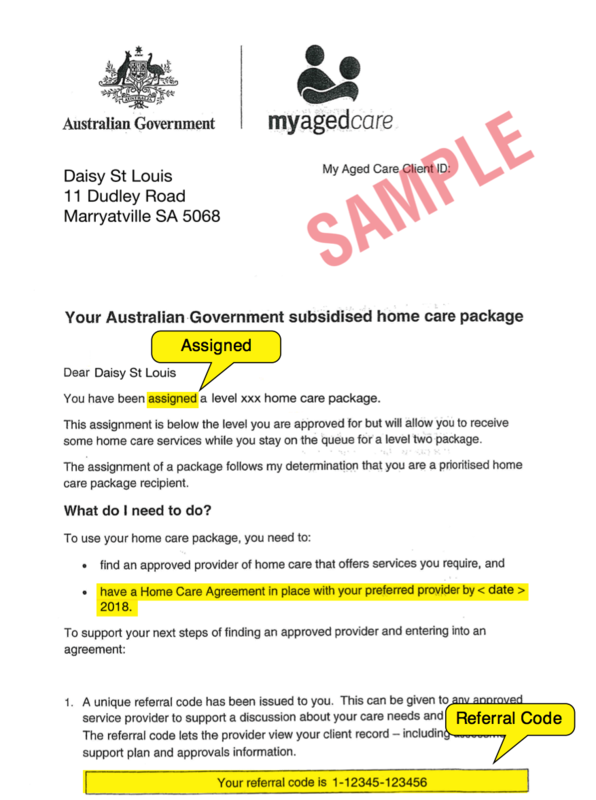 My Aged Care will send you a letter stating that you have been approved for a home care package and it will also tell you what level of package you have been approved for. However at this point, you have not been allocated a home care package yet. This occurs later. You will then need to wait for a period of time before a package is allocated to you. There is an allocated amount of home care packages that the government provides annually with many home care packages to approve. This means you may need to wait for a period of time for your home care package to be allocated. If you are considering home care down the track, the sooner you get started on your application the better. What if I need home care immediately and cannot wait for my home care package allocation? In this case, St Louis provide home care as a fee for service (St Louis Private Services) for this interim period. We will tailor the care to meet your most urgent needs and keep it affordable for you. Once you know you will be receiving a home care package and while you are waiting for an allocation, it is a good time to start looking at home care providers and figuring out what services you most require if you have not done so yet. There are many questions you will want to ask your home care provider during your research. St Louis run information sessions to answer these questions and you can also speak with one of staff directly on 1800 785 684 or Adelaide (08) 8332 0950 and Victor Harbor (08) 8552 1481. We will explain the type of home care services we provide, how we provide these, how we work with you to create your personal home care plan and the out of pocket expenses, if any, you may be required to pay. You can also go to the My Aged Care website and access their home care provider checklist which is available in 18 languages. After a period of time, you will be sent a letter with the allocation of your home care package confirming the level you will receive. Sometimes you will not immediately receive the level of home care you are eligible for. The level home care package allocated may be lower than your needs but it allows you to start accessing home care services until a package at your approved level becomes available. VERY IMPORTANT – You have only 56 days to find a home care service provider and enter into a home care agreement from the date of your assignment letter. If you need more time, please call My Aged Care and they may be able to extend it by another 28 days. At this point, the St Louis team will discuss your home care agreement and what this entails. It will include fees, services, your rights and responsibilities as well as your actual home care plan which is created in partnership with you. As your chosen provider, St Louis will provide your home care for as long as you need it. We work with you and your changing needs as you age, to deliver home care and home care services that enables you to stay at home for as long as possible, if not the rest of your life. A little bit of extra help goes a long way. If you are at the very start of applying for a home care package and don’t know what to do next, or if you have already started and need some more information, please call St Louis on 1800 785 684 and we will help guide you through the application and approval process.